Home > Featured > Is your marriage a little stale? The ‘lifeline’ for marriages, Retrouvaille, is holding its autumn weekend from Friday 7 October to Sunday 9 October at Emmaus Conference Centre in Swords. 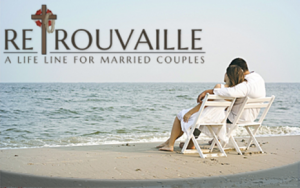 A Retrouvaille weekend is for couples experiencing difficulties in their marriages. “They can be going through major or minor difficulties,” Mike Loughman from Retrouvaille told CatholicIreland.net. The weekend proved transformative for their marriage. Other couples now involved in presenting weekends had been on the verge of separation or had actually separated. Through the communication tools they learned on the weekend, the embers of their love were re-ignited. Couples who are separated are also invited to the weekend. “It is not a problem. If they are prepared to work and put in an honest effort then it will work for them,” says Mike. Accommodation at the conference centre is in twin rooms, but single rooms can be arranged if necessary. Retrouvaille has an extraordinary success rate. Mr Loughman says it is not just that couples commit to stay together (as people did years ago ‘for the sake of the children’). “Retrouvaille teaches the way of communication that helps us avoid the pitfalls that many of us fell into when we tried to talk about a situation or a problem and it just made things worse by our talking even though we had good will,” he adds. The weekends are open to all married couples – those married in church and those with civil marriages. Three couples present the programme, sharing their own stories of the problems they fell into and how they dealt with them. Their experiences cover the whole gambit of human life. After each presentations the couples attending the weekend are invited to spend some time communicating in the new way they have been taught. The sharing takes place between the couple themselves and with no-one else. One topic purposely not broached on the weekend is conflict resolution. Instead this is dealt with during one of the four follow-up meetings which take place in Dublin at two weekly intervals on Sundays (9am to 3.30pm) after the initial weekend. “We don’t do it on the weekend as we don’t want people there just trying to solve their problems. The weekend is for learning to communicate. It is not the time to delve into deep problems,” says Mike. Retrouvaille’s autumn weekend takes place from 7.30pm Friday 7 October to 4pm on Sunday 9 October at Emmaus Conference Centre in Swords. Places are still available. The weekend costs €500 per couple which covers accommodation, meals, conference materials and the four follow up meetings.